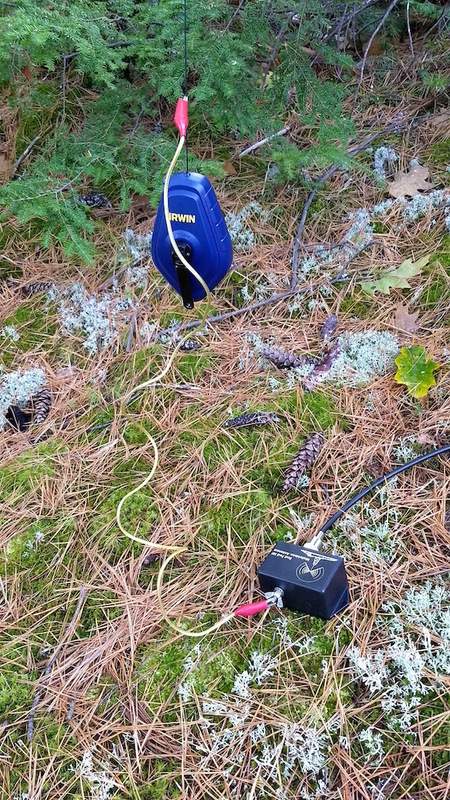 I first discovered a wire antenna winder when talking with a fellow ham Hanz Busch, W1JSB back in 2014. Hanz told me how he had a standard chalk reel that contained a wire antenna. I’m the AsktheBuilder.com guy and prior to that worked as a custom builder and remodeler for decades. You can imagine how many chalk reels or chalk boxes have been in my tool belts! Years ago chalk reels took lots of turns to get the string back into the box. New chalk reels are geared so the string is sucked back into the winder like a kid slurps spaghetti into his mouth at the dinner table. 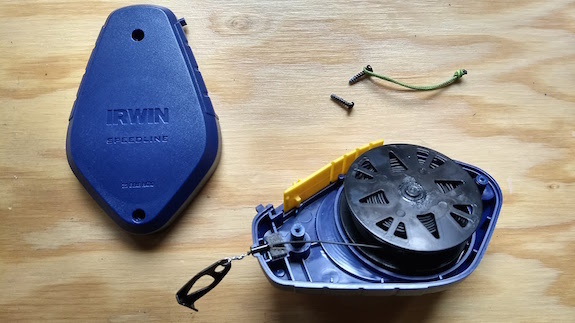 My Irwin Speedline chalk reel has a 3:1 gear ratio that allows me to retrieve 60 feet of 26-gauge teflon coated stranded wire back into the box in three or four seconds. This chalk reel is made from plastic and it’s very lightweight. How Much Wire Will the Reel Hold? I loaded 60 feet of the thin wire onto the spool inside the reel and still had leftover room on the spool. I estimate you can load about 100 feet of wire onto the spool. If you attempt to put more on, there’s a good chance some of it may not stay in between the sides of the spool. Look at the photo below showing the excess space on the spool. Other brands of reels may have a larger internal spool allowing you to load more wire. Why is the Gearing Important? You’ll appreciate the gearing speed if you need to break down your outdoor radio station in cold or threatening weather. I saw about 18 months ago that Steve Galchutt, WG0AT, built one so he could scamper down from his SOTA activations when the storm clouds rolled in on top of his Colorado peaks. What Kind of SWR do you get? 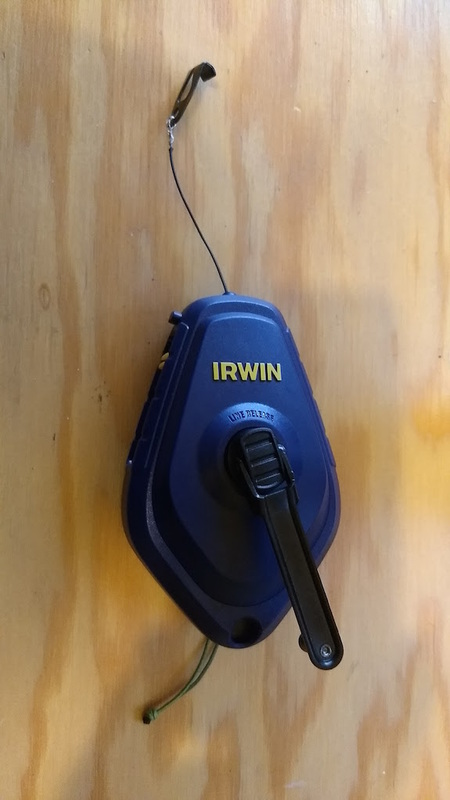 I’m able to achieve a 1:1 SWR with the antenna when I pair it up with my Elecraft KX2 and KX3. Both have the factory-installed Elecraft tuner. 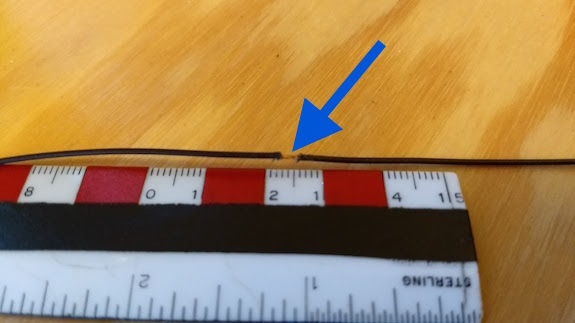 I discovered you can get a perfect 1:1 SWR match with the Elecraft tuners if the total wire length is 29 feet. 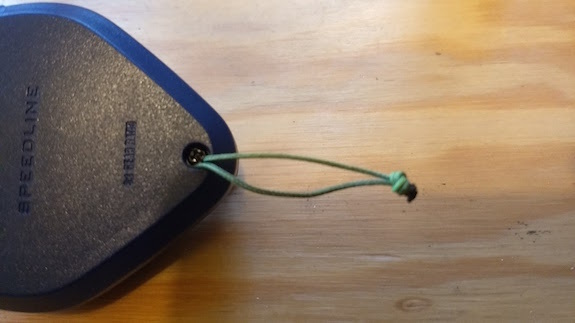 All things considered, the chalk reel adds just a tiny amount of weight to your backpack, but the advantage of retracting the wire fast and keeping it clean is a big advantage.